This ride was made by Allesandro Perrone. An Italian motorcyclist who now lives in Luxembourg, and has made this trip for the PC800 club Netherlands. Trip from Bastogne to Vianden or actually Franchimont which lies a little to the south of Vianden 205 km. We start our trip on the McAuliffe square at the American Sherman tank called Baracuda. This has done service here at the time of the Ardennes Offensive and has earned a beautiful place. Bastogne has several of these tanks and also museums that recall this intense period. We continue our route south and enter the Grand Duchy of Luxembourg from Belgium. The southernmost point of our ride we reach at the town of Arsdorf. Then we reach the Place Esch-sur-Sure where we stop in the parking lot on the Rue des Jardins where we have a view of the Castle of Esch-sur-Sure. 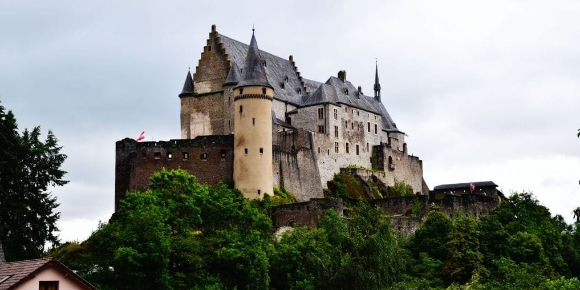 We continue our journey towards Bourcheid and Brandenbourg and reach our most easterly route point Vianden where you will find a fantastically maintained and partly restored castle. When you visit the castle and take a tour it will become clear that here too the ties with our Oranjehuis are very close. We continue our journey north through Luxembourg and find it just before we cross the border to Belgium again a pleasure to fill the tank of our engine with gasoline in Luxembourg in terms of price for our pre-war. After crossing the border, we continue our trip on Belgian territory northwards and reach our next point Malmédy via Sankt-Vith and Baugnez. In Malmédy we find the famous Obelisque Fontain on the Place Albert 1er. Besides the famous Obelisque Malmédy has many other beautiful buildings where you can find yourself just by stretching your legs. The architectural styles are diverse, such as the kiosk on the Place du Pont Neuf in neoclassical style. We continue our trip towards Robersville and then head towards the end of our trip. As said, this is slightly below Vervier in the town of Franchimont Theux. Here ends the trip at the Chateau de Franchimont. 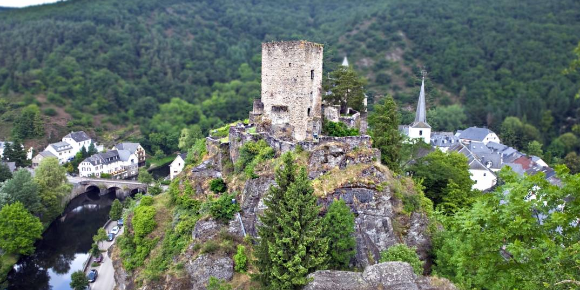 The Castle of Franchimont is a medieval fortress built in the 11th century on a rocky spur which overlooks three valleys north of the Ardennes, 8 km from Spa. This breth us at the end of our approx. 200 km long trip. All credits for this trip are for Allessandro Perrone an Italian member of the PC800 club Netherlands. You can download this route for free without a MyRoute-app account. To do this, click on the button 'Use route' and then on 'Save as'. Do you want to edit this route? No problem, click on the button 'Use route' and then on the button 'Tutorial editor' after which you can start the trial of MyRoute-app all-in-one. During this trial of 14 days you can also use our premium navigation app for free without any obligations! Using this GPS route is for your own account and risk. The route has been compiled with care and checked by a MyRoute-app accredited RouteXpert for use on both TomTom, Garmin and MyRoute-app Navigation. Due to changed circumstances, road diversions or seasonal closures there may be changes, so we recommend checking every route before use. Preferably use the routetrack in your navigation system. For more information about the use of MyRoute-app, please visit the website at 'Community 'or' Webinars'. The images and text displayed here originate from the Wikipedia article "Luik", which is released under the Creative Commons Attribution-Share-Alike License 3.0. Aivi Belinda Kerstin Luik (born 18 March 1985) is an Australian soccer player who currently plays for Levante in the Primera División and Melbourne City in the W-League; and the Australia women's national soccer team. She previously played for Brisbane Roar and Perth Glory in the W-League, Brøndby IF in Denmark's Elitedivisionen, Fylkir in Iceland's Úrvalsdeild kvenna, Notts County F.C. in England's FA WSL, and Vålerenga in Norway's Toppserien.